This refreshing and vitamin-packed fruit has won us over! The pineapple has a popular reputation for burning the fat. But is it really the slimming aid that so many magazines claim? Even though this exotic fruit only grows on the far side of the world, it has become a mass consumer product. In 2017, world production hit 30 million tons. 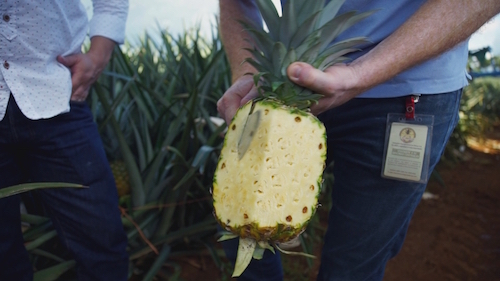 Within a few years, Costa Rica became the world’s foremost exporter of pineapples. There, intensive agriculture has proved to be a gold mine for multinationals. Dole, Del Monte and Chiquita own vast plantations that stretch to 2000 acres. To boost production, farmers push the use of pesticides to the limit. This monoculture is having serious consequences on the environment and the local population. Recently, however, older varieties of pineapple have made a major comeback, such as the organic sugar loaf. This species is grown on small plantations in West Africa. How are these small producers working to break into this market that is largely dominated by the giants of the agri-food industry? After being long considered a rare exotic fruit, how did the pineapple become so common on our plates? Does it really have beneficial effects on our health as some sellers claim? We investigated to discover whether the pineapple still has secrets to hide.